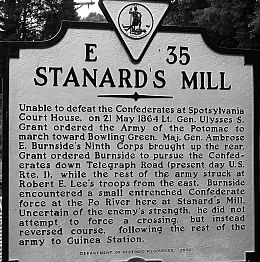 As Burnside’s corps traveled down Telegraph Road towards Stanard’s Mill, he sent ahead one of General Robert Potter’s brigades to secure the crossing at Stanard’s Mill. Less than a mile away from the mill they encountered Confederate troops and the Federals were able to force a retreat across the Po River. When the Federals came to the river they found a well-entrenched artillery on the opposite side of the river. Potter searched for another place to cross the river, but Burnside suspended the advance and most of the brigades were sent towards Guinea Bridge as an alternate route (Rhea 340). 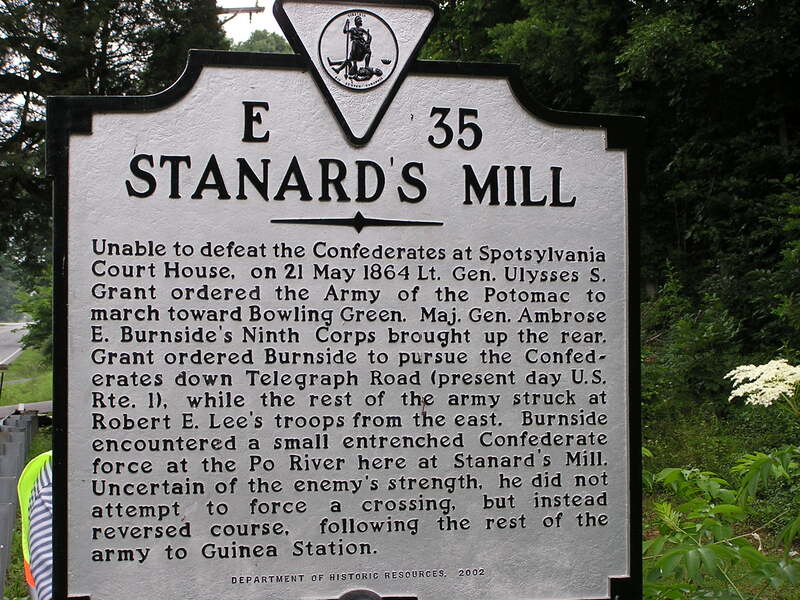 For more information on the events, people, and places associated with Jerrell’s Mill see the following Historical Marker Page: Start of Sheridan’s Raid E-39 and Turn in Sheridan’s Raid E-30 and Spotsylvania County Courthouse E-128. “Stanard’s Mill Marker,” Virginia Department of Historic Resources, www.dhr.virginia.gov (accessed April 18, 2008). Rhea, Gordon C. The Battles for Spotsylvania Court House and the Road to Yellow Tavern. Baton Rouge: Louisiana State University Press, 1997.